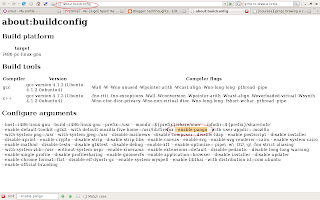 Do you have problems reading Indic lanaguage websites? Do you see incorrect rendering such as misplaced matras, aadha akshar appearing with a halant? Have you been blaming firefox/Ubuntu for not getting such basic stuff right? Well not to worry as the fix is a very simple series of steps. First check if your browser has been compiled with the --enable-pango flag. To check this, type "about:buildconfig"(without quotes) in your address bar and look for the string --enable-pango (See screenshot below). For most people on Ubuntu, this flag should be there, but in case you have one that doesnt have this flag, you will have to obtain a firefox build that was compiled with this option. If you cant read Hindi open your favourite website and see if it renders properly. Font Details: On Ubuntu Go To System->Preferences->Fonts and check what Hindi/Tamil/Your Language fonts(if any) you have. Pango is a free and open source computing library for rendering internationalized texts in high quality. Different font backends can be used, allowing cross-platform support, that was written as a part of GTK+ widget toolkit.